Ladies, get ready to indulge yourself in a naturally-inspired line from Essence of Beauty, CVS/pharmacy’s #1 best-selling fragrance and body care line. Launching this month, the exclusive line is infused with nourishing, aromatic botanical ingredients and essential oils to bring the benefits of botanicals into your everyday bodycare regimen. 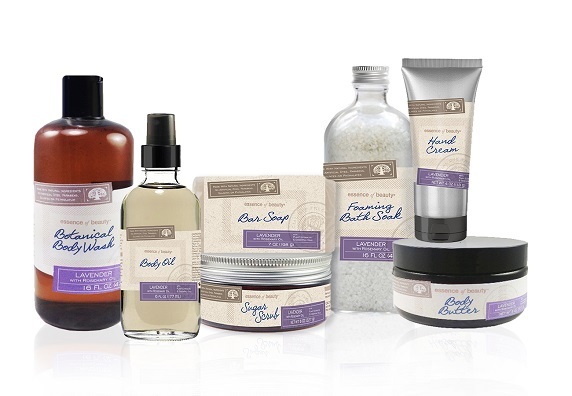 Available in 3 scents, the products fulfill each part of your bath ritual and includes seven naturally-inspired bath and body products: Hand Cream, Body Butter, Sugar Scrub, Botanical Body Wash, Foaming Bath Soak, Nourishing Body Oil and Shea Butter Bar Soap. The formulas contain plant extracts and essential oils, and the line is free of parabens, phthalates, petrolatum and gluten. The Lavender with Rosemary Oil is my favorite. I tried their Body Butter and it has a very alluring scent that lasts all day. Its super rich and hydrating and extremely moisturizing. I really loved it. The Naturally Indulgent Bath & Body Collection ($5.99-$9.99) is available this month exclusively at CVS/pharmacy and online at www.CVS.com. One lucky Babblings of a Mommy reader can indulge herself now with a prize package of Naturally Indulgent products!! The prize pack includes: (1) Lavender with Rosemary Oil Sugar Scrub, (1) Lavender with Rosemary Oil Body Wash, (1) Lemon Verbena with Olive Oil Hand Cream, and (1) Eucalyptus with Mint Oil Bar Soap. To enter to win simply follow the instructions on the Rafflecopter widget below. I'm most excited about the sugar scrub. Absolutely love how the scrubs make my skin feel afterwards. I'm most excited to try the sugar scrub and bath soak! I'm most excited to try the Lavender with Rosemary Oil Sugar Scrub. The mint oil soap sounds great! I'd like to try the body wash! I'm most excited about the lavender body butter! I'm most excited to try the sugar scrub, I love body scrubs! The lavender sounds like my jam! I think that eucalyptus mint soap sounds like it would smell amazing! I'd be most excited to try that. I would really like to try the hand cream..sure to smell wonderful. Wow, they all look dreamy. I do love a good body scrub though. I'd love to try the Botanical Body Wash. So excited to try the Eucalyptus with Mint Oil Bar Soap. I love the smell of eucalyptus and mint! I am most excited to try the Lavender with Rosemary Oil Body Wash!! The lemon verbena sounds wonderful - it's one of my favorite scents. I'd especially like it in the body butter. Thank you for the giveaway! I am most excited about tying the Essence of Beauty Lavendor with Rosemary Oil Botanical Body Wash. I am most excited to try the Lemon Verbena with Olive Oil. lavender rosemary oil body scrub! The hand cream! I am always looking for a great hand cream! The Lavender & Rosemary Sugar Scrub sounds wonderful especially for fall! The eucalyptus and mint soap sounds wonderful! I'm most excited to try the body oil wash.
Im most excited for the body oil! The Lavender with Rosemary Oil is my favorite. The Eucalyptus with Mint Oil sounds awesome. I love these scents!